Years ago.. about a decade ago, we used to use some kind of .ini or .inf file to tally up mismatched printer driver names between client & server when using Terminal Services printer redirection. It’s long winded process, and I can’t really find any information on how to do it now. I did eventually find the information about a month ago, but it wasn’t easy to find, and when I looked at it I decided I just wanted to go home. This problem is beginning to occur more frequently again now between Windows 10 and Windows 7. The situation is a Windows 7 Professional computer in the office, and a Windows 10 computer at home, trying to use Remote Desktop to access the Windows 7 computer. 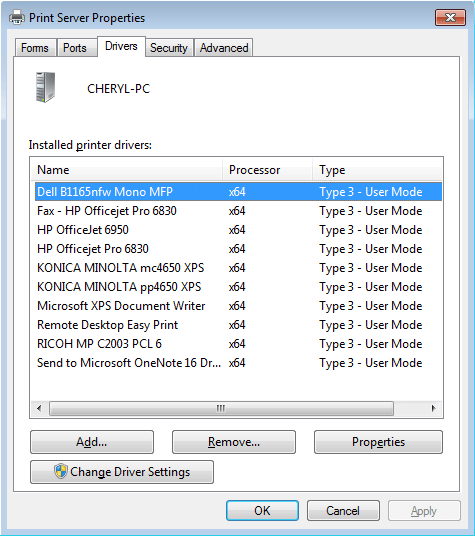 Both HP and Dell, have different names in their Windows 7 drivers vs. the Windows 10 drivers. So when faced with the same problem again today, I tried a different fix, and it seemed to work just fine. I changed the driver name in the registry, restarted the Print Spooler, and the name changed in the drivers list. I disconnected / reconnected to Remote Desktop, and the printer redirection worked as it should. As you can see in the pictures below, the key itself just needs renaming under HKLM\SYSTEM\CurrentControlSet\Control\Print\Environments\Windows x64\Drivers\Version-3 (or whatever for your specific driver). 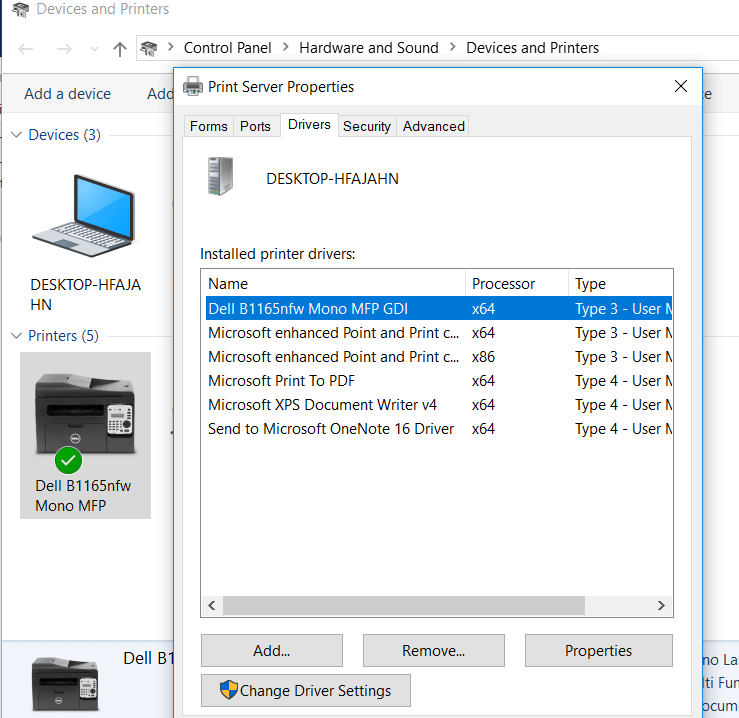 In the screenshot below, I am adding “GDI” to the end of the “Dell B1165nfw Mono MFP” driver name, so that it matches with the new Windows 10 laptop that the person is connecting from. and here is me altering that name back on the Windows 7 Pro computer. I have added ” GDI” to the end, so that the names match. The print spooler service needed restarting for the updated name to appear.